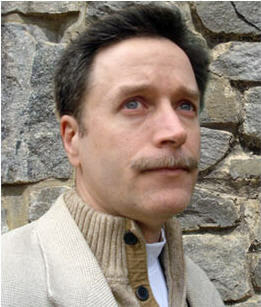 Michael: I don’t that that anyone will find it interesting, strange maybe—and I know my wife was a bit shocked when she found out, but when I’m starting on a novel, or stuck on a current work in progress, I go for a walk (hopefully somewhere secluded) and have out loud conversations with myself. I actually play two people. One asking questions of me, and then me answering that person back…and as I said it has to be out loud otherwise the approach doesn’t produce the same results. I think someone who knows more about the anatomy of the brain might be able to describe why that is…in regards to some connection between verbal function and creativity, and a psychiatrist may have other things to say on the subject…but for good or ill it works for me. TQ: If you were stranded on a desert island for one year, which 5 novels would you want to have with you? I was once asked this question, but the interviewer said, “books” rather than novels, and I said I wanted “How to Survive on a Desert Island” drat you for plugging that loophole. I guess it would have to be those that I don’t mind reading over and over again, and actually there are few stories that I have actually re-read. · Watership Down: Speaking of “old friends…” I’ve re-read Richard Adams’ book several times and still like the bonds between those rabbits. I really liked how each character was unique and I really wanted to be along with the band of rabbits in search of a new place to call home. 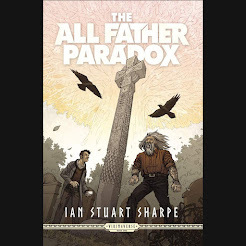 · The Stand: Also has great characters (you may see a theme starting to form) Some of my all time favorites: Nick Andros, Tom Cullen, Stu Redman, Mother Abagail, and Fran Goldsmith. If I ever have to go through an apocalypse I would want it to be with people like them. · The Riyria Revelations: Now before people stone me for blatant self-promotion, or accuse me of having too big a head, let me explain. I wrote those books to fit with my preferences like a hand to a glove. They are “exactly” the kind of books I love. There were times (during editing) that I couldn’t bring myself to look at them again. But from time to time I go to look something up in them and find myself re-reading and I’m whisked away once more. When you design something “perfect for you” it’s not surprising that “I” would like them…the fact that there are “others” that do is the big surprise. Michael: Definitely a plotter, there was a period when I was a panster, but I found that I wasted huge amounts of time going down a road that wasn’t going anywhere. Now that’s not to say that I’m so rigid that I don’t allow for serendipity. It’s like planning a trip and I choose what cities I’m going to stop at along the way for a meal, or to spend the night, but if I’m traveling along and something that looks interesting, then I’m all for exploring where that might go. Generally I spend six days a week writing and one day for “thinking.” These are the times that I examine the road ahead and determine whether I need to adjust the outline as necessary. It also depends somewhat on the characters. I’ve had characters that have out rightly refused to go where I wanted, and I have to listen to them – they are always right. Then there is the character who has gotten extra “screen time” as they turned out to be so much fun once I started with them. So I guess it is a little of both…but I do use the outline as the basis. TQ: Describe The Riyria Revelations in 140 characters or less. Michael: Two unlikely heroes caught in a series of escalating adventures filled with twists, humor and scenes both heart-warming and heart-wrenching. TQ: What inspired you to write The Riyria Revelations? Michael: Wow, long answer or short. I’ll try for “just right.” I had written for over a decade, primarily literary fiction where I toiled on the craft of combining words, more than the story itself. I became quite good at it, but wasn’t having any fun, nor was I getting any publishing offers, so I ended up giving up creative writing completely. When my daughter (who was thirteen at the time) was struggling with reading (she’s dyslexic) I bought her Harry Potter. She didn’t read it, but when I did, it reminded me of how fun a good adventure with likeable characters could be. I decided to write a story for Sarah, with no intention on publishing. So I returned to an idea that had been banging around in my head even before I had quit writing. So I guess it was a combination of returning to fantasy (which made me fall in love with reading in the first place), my daughter (to give her something to enjoy reading), and Rowling (who reminded me how much fun a good story can be). TQ: What sort of research did you do for The Riyria Revelations? Michael: Well it’s based on Medieval Europe and has scenes ranging from courtly life within a castle, to ships on the high seas. I researched everything from clothing, food, customs, battle techniques, armor, weaponry, and so on. But it is an invented world so I had the flexibility to take what I wanted, combine things that never existed together, and develop a world that followed the rules that I wanted. One of the most delicate tightropes was in The Emerald Storm, because part of it takes place on a ship. I wanted to make sure that I exposed enough of the research to prove that I didn’t just “wing it,” but I also didn’t want to bore the reader with facts about sailing that wasn’t necessary to the plot. 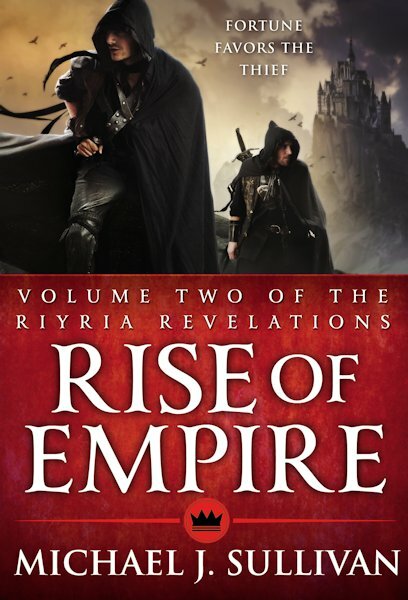 TQ: The Riyria Revelations are composed of 6 novels. I've read that the series is designed like a television series. How does that translate to your novels? Michael: What I’ve meant by that is I’ve written a “season” (the series) where there are mysteries, or you discover a little more about someone’s past in small dribs and drabs, but each “episode” (a single book) will have its own conflict and resolution. I didn’t want to just “stop” at a given number of pages and force people to read the next book to get closure for the previous one. My goal has always been to write books where people “wanted” to read the next, rather than being held hostage to. I wrote all the books before releasing any of them and this allowed me to adjust earlier books when I came up with a really good idea in a later one. This also allowed me to structure the series somewhat unconventionally. I designed the first books to be purposefully light and therefore the weakest. 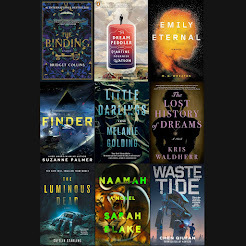 I did this so that each subsequent book would be better than the last and the series would build overtime. Most series work the other way around, they start off with a lot of front loading so you can really know and identify with the characters. In mine you may quit after the first book thinking they are not “fully fleshed out…because they aren’t but will be by the end of the series. This may not have been the “smart” way to go about things, as some people may drop out early. But when I wrote the books I had no intention on publishing, and the few friends and family that were my intended audience I was pretty sure would read to the end. Michael: Royce and Hadrian (the two male leads) are very easy to write. Especially the banter between the two of them, which so many people cite as one of the reasons they like them so much. I’ve been “with them” so long that it just flows really naturally, and in any situation I know exactly how either of them would react. The hardest would probably be Merrick Marius. He is described as a genius who is always thinking multiple moves ahead and constructs very intricate plans that can be quite elaborate. Making him live up to the hype that I gave him wasn’t easy. I don’t want to give too much away, but he does end up being quite the master manipulator and it took me a while to fit some pieces into place so that he could be as smart as I wanted him to be. TQ: Which character(s) in The Riyria Revelations surprised you the most? Michael: Probably Myron, who in the first book is a very sheltered, shy, and all around naïve guy who provides some great comic moments. He also provides some extremely touching scenes, in particular the “squirrel tree” scene in the first book, The Crown Conspiracy. I left Myron out of books two through four and when we next meet him he has grown into someone pretty incredible. His transformation makes him nearly invisible because he is so completely at peace with himself, the world, and the god he worships, that he has absolutely no fear. He blossomed into a remarkable human being and I wish everyone could find as much contentment in their lives as Myron does. Two opposing individuals possess limitless magic, providing the universe balance. An unexpected death transfers this power to an unsuspecting bystander who is clueless of the consequences of his newfound abilities. Have you ever wondered how the world will end? No? Well don’t sweat it. Most people don’t, and the few that do expect the cause will be a dramatic change in climate, a pandemic or mostly likely war. That’s what we’ve all been taught to believe, and we’re comfortable with rational explanations. 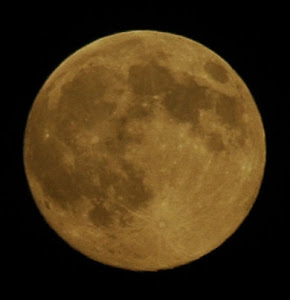 But people weren’t always so quick to accept the facts provided by the so-called experts. There used to be a time when we believed in myth and magic. Our minds were open to the idea of believing in what can’t be seen…the fantastical. I had been like you until I met Winston Stewart; the day I learned to believe that there are other forces at work—not the least of which is fate. Fate is an amazing thing. It put Gandhi in South Africa, Nelson at Gibraltar, and Winston Stewart on that train in Alexandria Virginia. You say you don’t know who Winston Stewart is? Don't worry...You will. The other two books are a series, but I don’t want to say too much about them just yet. My wife only recently got her hands on the first one and loved it…and is now in the process of tearing it to pieces and reconstructing it. I’m editing the second one, and really like how it is coming out but until Robin, and the publisher read it who knows what will become of it. I’m also starting work on my “next big project” I anticipate this will be at least a three book series and all the pieces are coming into place nicely. It takes a while to come up with the “big themes” and what I’m going to be focusing on so I start this well in advance. I’ve been “working” on this for over a year now, as a background activity but now I’m working more formally on it and hope to start writing that comet the fall. Royce Melborn, a skilled thief, and his mercenary partner, Hadrian Blackwater, make a profitable living carrying out dangerous assignments for conspiring nobles-until they are hired to pilfer a famed sword. What appears to be just a simple job finds them framed for the murder of the king and trapped in a conspiracy that uncovers a plot far greater than the mere overthrow of a tiny kingdom. Can a self-serving thief and an idealistic swordsman survive long enough to unravel the first part of an ancient mystery that has toppled kings and destroyed empires? And so begins the first tale of treachery and adventure, sword fighting and magic, myth and legend. 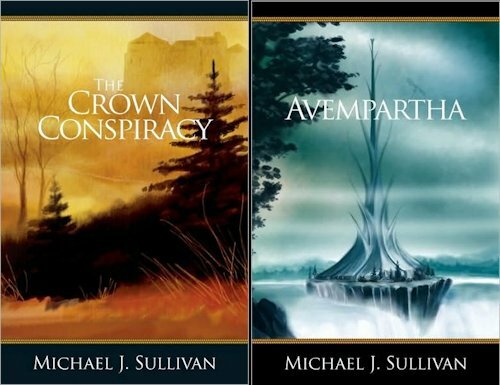 Theft of Swords was originally published as: The Crown Conspiracy and Avempartha. The New Empire intends to mark its victory over the Nationalists with a bloody celebration. On the high holiday of Wintertide, the Witch of Melengar will be burned and the Heir of Novron executed. On that same day the Empress faces a forced marriage, with a fatal accident soon follow. The New Empire is confident in the totality of its triumph but there's just one problem-Royce and Hadrian have finally found the true Heir of Novron---and they have their own holiday plans. 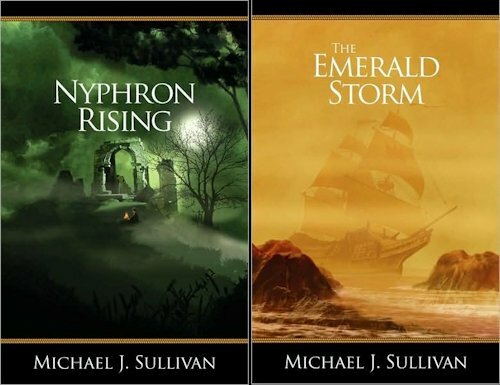 When author Michael J. Sullivan self-published the first books of his Riyria Revelations series online, they rapidly became ebook bestsellers. Now, Orbit is pleased to present the complete series for the first time in bookstores everywhere. 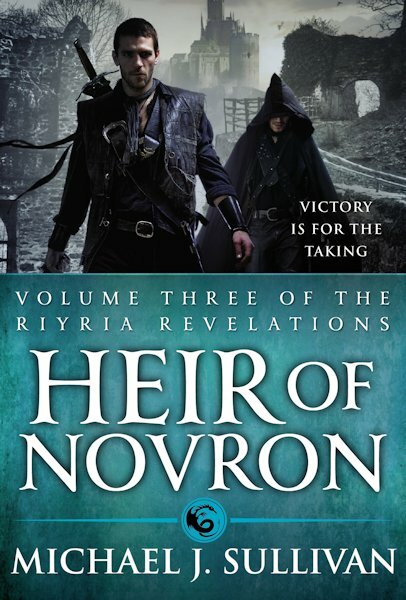 Heir of Novron is the final volume of The Riyria Revelations and includes Wintertide and ---available for the first time--- the final volume, Percepliquis. Well, I have an excuse to have him back!! 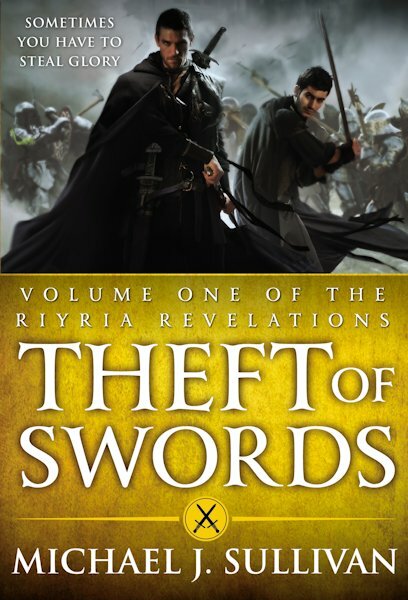 The Riyria Revelations is one of my all time favorite series and one I recommend to all fantasy lovers. Great interview and I can't wait to read more books by Mr. Sullivan. 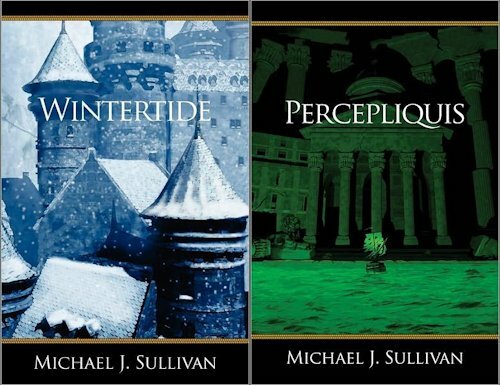 Michael Sullivan is a new author for me but not for long. This sounds like a series I will enjoy. Thank you for the interview! Really great to know what's up and coming. I haven't read his books - though own them all - but according to my dutch reading community they're quite something! Also, Mr. Sullivan is a very nice man :) When we were discussing the fist book this January, he was kind enough to join our community and answer all our questions. I love fantasy, and the Riyria Revelations sounds like a series I would enjoy. I will have to check it out! Good luck with your next series, your back blurb is intriguing.